Mitt Romney is filthy rich, he's handsome, and he's the first honest-to-god businessman to have a real shot at the White House in 40 years. (Fortune Magazine) -- Willard Mitt Romney looks great in a suit. Which is good for him, because all day "Matinee Mitt" has been wearing a crisp, gray number. Speeches, grip-and-grin events, a veterans hall - no venue-appropriate costume changes, just pure Brooks Brothers. Even now, when it's 85 degrees and he's surrounded by people in shorts, the man won't so much as loosen his tie. It's Memorial Day, we're standing around waiting for a photo shoot to begin in front of his summerhouse on New Hampshire's Lake Winnipesaukee, and he's refusing his handlers' pleas to at least take his jacket off. "This is going to be like Nixon on the beach," a campaign worker mutters, referring to a 1960s photo of the late former President strolling the sands of sunny San Clemente, looking as though he'd rather be negotiating with the Soviets. 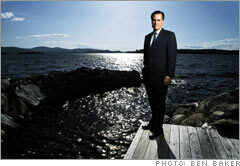 Mitt Romney standing on pier in front of his home on lake Winnipessaukee, NH. 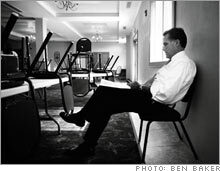 Mitt Romney, a few minutes before appearing at a "Ask Mitt Anything Town Hall Meeting", in Muscatine, Iowa. "I'm a big believer in allowing the free market to work and not allowing the government to lay a heavy hand on how businesses operate." "I want to get rid of all capital gains taxes for middle-income taxpayers. I also think it's fundamentally unfair that you get taxed when you've earned it, taxed when you save it, and taxed when you've died. So I'd get rid of the death [estate] tax, too, for middle-income Americans." "I would keep parts of Sarbanes-Oxley that have proven effective in insisting on managerial responsibilities. For instance, it's important that CEOs and CFOs continue to sign statements attesting to veracity of financial statements. But Sarbanes-Oxley, actually section 404, puts a weighty process and financial burden on small businesses." "I think it would be helpful to have a leader who understands how the economy works - who knows how to solve problems and would bring a fresh outside view to actually transform Washington into an enterprise that can tackle tough problems and not simply engage in partisan bickering." Has been known to pop his own popcorn, which he then brings into movie theaters. Pep squad, Cranbrook School in Bloomfield Hills, Mich.
Arrested in high school for sliding down a hill on an ice block at a golf course. As a teenager, liked to dress up as a policeman and scare friends on dates in their cars. At 21, after a car crash in France. Romney survived, obviously. He is, after all, the most serious major-party presidential candidate to come out of the business world since ... well, since his father, George Romney, onetime CEO of American Motors, who ran in 1968. Unlike fellow Republican George W. Bush, Romney, 60, can't be accused of being a political heir with some private-sectorish experience. He's the brilliant strategist-dealmaker who founded Bain Capital and built it into one of the largest private-equity firms in the world - and accumulated a personal fortune of around $400 million in the process. He's the turnaround artist who saved the 2002 Winter Olympics. And, as governor of Massachusetts, he's the policy innovator who pushed through some of the most promising health-care-reform legislation in a generation. People who know him won't shut up about how smart and pragmatic and decisive he is. "Mitt never takes anything at face value," says Glenn Hubbard, dean of Columbia's business school and a Romney (and former Bush administration) economic advisor. "He's constantly questioning." Says Fraser Bullock, a former Bain partner who worked with Romney on the Olympics: "He's not an ideologue. He makes decisions based on researching data more deeply than anyone I know. As people get to know him better, they'll see an extremely competent, strong leader." If the election were based on r�sum� bullet points, the guy would be a shoo-in. That's not how it works, of course. As we'll see, Romney has felt the need to downplay his career highlights. Some in his party worry that he's too pragmatic - that he's not ideological enough. And there's his Mormon faith, which, like it or not, probably hurts his chances. But his business skills have come in handy. In recent polls he's the leading Republican candidate in both New Hampshire and Iowa, which is impressive, considering that he started out without the name recognition of John McCain or Rudy Giuliani. (Nationally he's lagging behind Giuliani, McCain, and Fred Thompson, the former Tennessee Senator.) More impressive still is his money-raising ability: He's raised more and has been spending it faster than his Republican opponents on ads and campaigning. His strategy, his national campaign director has said, is that "money talks, but early money screams" - legitimacy, that is. Romney was always a self-starter. "He has more energy than anyone I know," says Geoffrey Rehnert, who helped Romney start Bain Capital. He grew up steeped in business and politics. His father had parlayed his automobile industry success into a three-term governorship of Michigan; his mother, Lee, once ran for the Senate. After graduating as valedictorian from Brigham Young University, Romney headed off to Harvard, where he finished in the top 5% of his MBA class and simultaneously earned a law degree. Then he got a job at Bain & Co., where he worked as a management consultant beside Meg Whitman, now chief of eBay, and former Dell CEO Kevin Rollins. Ultimately Romney grew frustrated because he couldn't implement the strategies he was recommending to clients. He was ready to leave Bain Consulting, the story goes, when Bill Bain offered him a chance to form a company in which he could put his management-consulting skills to work and share in any upside of the firm's stock performance. Bain Capital was born in 1984 with just $37 million to invest. Romney's new firm set out to find companies that were under-performing their peers. His sales pitch was that Bain Capital wasn't just an investing firm - it also knew from managing. From the beginning, Bain charged its clients a 30% fee, compared with the 20% standard private-equity fee. "Bain figured out before anyone that they could apply their consulting expertise, not just financial engineering, to the companies they bought," says Steve Kaplan, a finance professor at the University of Chicago's business school. "It was very unusual when they first started. Most firms have now copied the Bain model." For each potential investment, Romney and fellow Bainiacs would stage a "strategic audit," dissecting cash flow and market share and delving into customer satisfaction and management prowess. After studying a business in minute detail, Romney has said, "we had a pretty good map of what was right and wrong in terms of the business - what had to be fixed and which were urgent and which were long term." Under Romney, Bain invested and staged turnarounds in more than 150 companies, among them such household names as Brookstone, Sealy, and Domino's Pizza. From the inception of Bain Capital to 1999 - Romney's watch - the firm posted average gross returns in excess of 100% annually. Its assets grew to more than $4 billion. And Romney, of course, got rich.